The first historical evidence regarding the miracle, dating back to the year 1954, do not specify the exact year in which it took place, but some historical circumstances enable to chronologically collate the miracle between the years 730 and 750. The Byzantine emperor Leon III Isaurico, who reigned from 717 until 741, carried out very strict policies against religious images and, in the year 730, ordered their total destruction. Mosaics and frescoes were demolished with hammers, religious icons were thrown in fire, and several Greek monks were killed. Because of these events, many religious people, including a large number of basilian monks, found refuge in Italy. One day, while the monk was celebrating the mass in the church dedicated to the saints Legonziano and Domiziano located in Lanciano, he began to doubt of the presence of Christ within the Eucharist and the consecrated wine. The documents of the time have not defined the identity of the priest and have only specified that he was a religious man of Byzantine rites who was part of the basilian order. A document from 1631 describes this particular monk as "not very firm in his faith, knowledgeable in the sciences regarding the world, but ignorant in the ones regarding God; day by day, he would go around, doubting the fact that the true body of Christ could be in the Eucharist and if the consacrated blood could carry His blood." After stating the words for the consacration, thr Eucharist transformed into a bleeding piece of flesh, while the wine transformed into blood that subsequently coagulated into five lumps of different sizes. The priest then gave the news of what happens to the faithful who were gathered in the church. An epigraph, which was created in 1636, describes the event: "In the year of Our Lord seven hundred, in this church, which at the time was under the title of San Loguntiano de' monaci di San Basilio, a monk doubted of the fact that in the Eucharist was the actual body of Christ and that in the wine really was His blood. He celebrated the mass and, while consacrating the Eucharist and wine, watched them transform into actual flesh and blood. This was shown to the whole population and the neighbouring cities. The flesh is still intact and the blood is divided into five disegual parts that weight the same number both when united and when weighted singularly. This can still be seen to this day in this chapel, which was made by Joe. Francesco Valsecca, at his own expenses, in the year of Our Lord MDCXXXVI." The relics were enclosed within a theca made of silver and ivory, which was situated in a tabernacle positioned on the right of the main altar. In 1566, fearing that the Turks might profane them, they were placed in a little chapel whose entrance was walled. From 1636 on, the relics were enclosed in a locked iron grate. 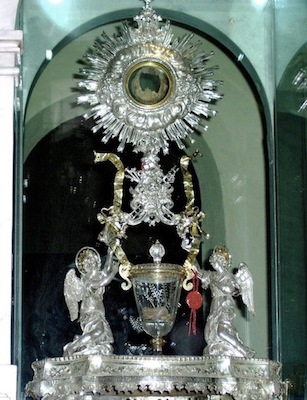 In 1713, the cristal chalice and monstrance, in which the relics can be viewed to this day, were created. The monstrance was situated in a marble structure built on top of the altar in 1902.